It’s no secret that we’re gaga for innovative Lego designs, and this clever Lego birthday invitation we spotted at LMNOP really stacks up. If you have extra bricks laying around, hand them out as colorful keepsake invites! Prudent Baby features a nursery bedding tutorial round-up which helps crafty mamas make everything from crib sheets to swaddle blankets to decorative garland! Check out this totally amazing Hobbit Home that was highlighted on Ohdeedoh. Lord of The Rings fans, prepare to swoon! Handmade Charlotte lets us know about these cool custom stamps of your baby’s handprint or footprint! 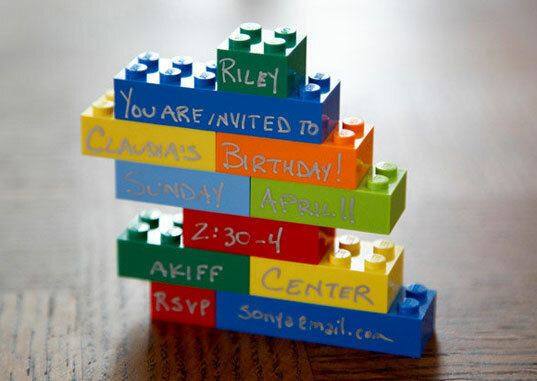 It's no secret that we're gaga for innovative Lego designs, and this clever Lego birthday invitation we spotted at LMNOP really stacks up. If you have extra bricks laying around, hand them out as colorful keepsake invites!